Human papillomaviruses (HPVs) are highly prevalent and potent human pathogens that cause over 5% of all human cancers, including cervical cancer (CxCa) and a subset of head and neck cancers (HNC). HPV-associated cancers result in a half of a million deaths every year worldwide. Our research group focuses on investigating virus-host interactions, particularly in the context of host immunity, to develop effective preventive and therapeutic strategies for HPV-associated cancers. During decades of cancer progression, HPV persists, evades host surveillance, and continuously contributes to host cell transformation. However, little is known about the mechanisms of disease progression driven by HPV. To understand the molecular mechanisms that drive HPV-positive cancer development, we have analyzed global gene expression changes using hundreds of human cervical and head/neck tissues in different HPV status (HPV-positive vs. HPV-negative) and disease stages (normal, early and late precancers, and cancer). Our studies have revealed a striking cascade of distinct HPV-specific changes in several host pathways including innate/adaptive immune regulations. Particularly, the chemokine CXCL14 is significantly downregulated during HPV-driven cancer progression by HPV E7-mediated promoter methylation. Our in vivo study has shown that restoration of Cxcl14 expression dramatically suppresses tumor growth in immunocompetent syngeneic mice by recruiting natural killer and T cells. We are currently 1) investigating the detailed mechanisms of CXCL14-mediated tumor suppression and 2) developing chemokine-based novel immunotherapies to treat CxCa and HNC. To establish persistent HPV infections, it is necessary for the viral genome to enter into the nucleus and establish its genome as a nuclear plasmid for long-term replication. Using our HiP virus production technology and high throughput screens, we have discovered that HPV infection is regulated by a variety of host factors/mechanisms including host cell mitosis, autophagy, and interferon-inducible proteins. We have recently shown that the interferon-inducible cytidine deaminase APOBEC3A functions as a restriction factor of HPV infection. Ironically, however, the HPV oncoprotein E7 significantly increases the level of APOBEC3A by inhibiting cullin-dependent protein degradation. HPV-positive CxCa and HNC were recently shown to harbor significant amounts of APOBEC3A mutation signatures. 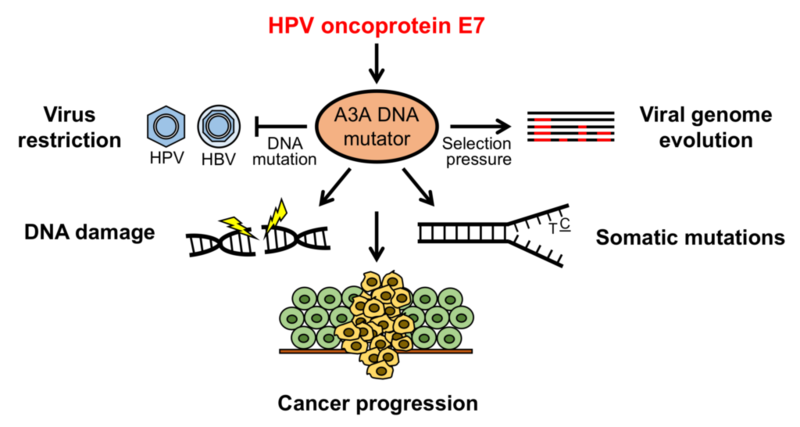 Thus, our findings raise the intriguing possibility that the induction of this host restriction factor by HPV may also trigger APOBEC3A-induced cancer mutagenesis. We are currently 1) investigating the mechanisms by which APOBEC3A restricts HPV infection and 2) determining whether APOBEC3A upregulation in HPV-positive cells facilitates somatic mutagenesis for cancer progression. Along with analyzing human patient specimens, we have established combined approaches with a novel HPV production system, in vitro primary/normal keratinocyte culture systems, and in vivo mouse models that recapitulate HPV infection and cancer development. Our research group is uniquely positioned to carry out basic and translational research, collaborating with other scientists and clinicians in virology, immunology, oncology, pathology, surgery, and bioinformatics.